R.L. Diorio is a Registered Builder Member of the Home Builders Association of Dayton and the Miami Valley (HBA). R.L. 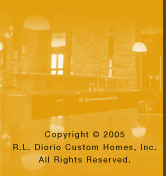 Diorio is also a member of the Ohio Home Builders Association and the National Association of Home Builders. Ron Diorio was President of the HBA of Dayton in 1989. Ron served on various committees at the HBA including Chairman of the Building Codes Committee from 1984 through 1987, was Homearama Chairman 1987 and 2005, Chairman of the Past Presidents Council in 1990 and was named Builder of the Year in 1997. At the 2006 Inaugural Ron received the 2005 Robert E. McDaniel - Carl L. Zengel Leadership Award which is the HBA's highest honor. Jennifer Diorio-Lawson was installed as HBA Treasurer at the 2006 Inaugural and will be President of the Association in 2008. Jenny was elected to the HBA Board of Directors in 2005 as the first woman builder member of the board in its 63 year history.